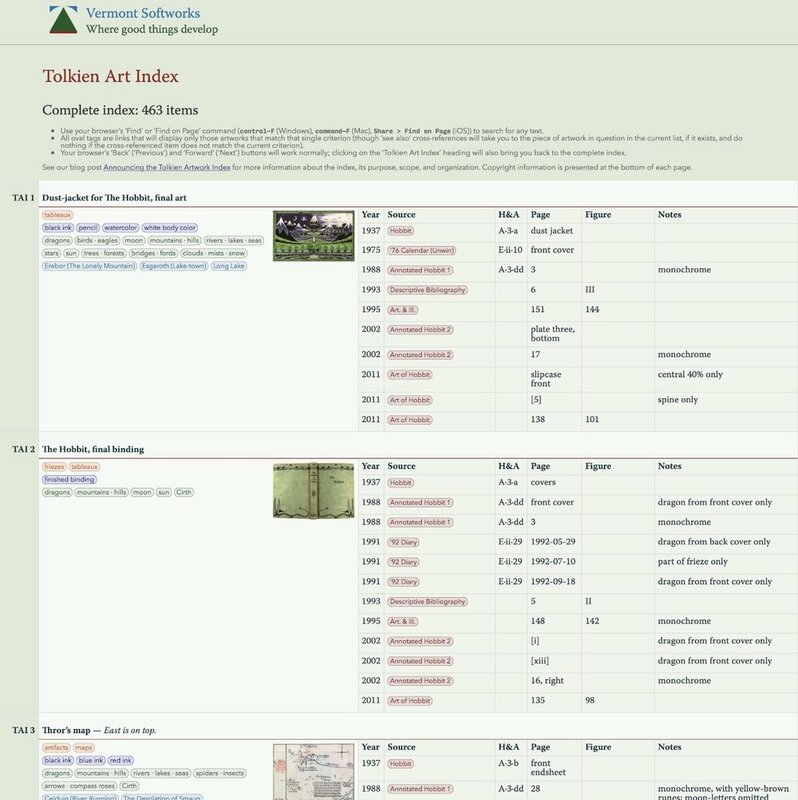 The Tolkien Art Index is live! 463 pieces of art by J.R.R. Tolkien are listed — essentially, everything that has been published that is even tangentially related to Middle-earth. At this point, there are titles, descriptions, notes, tags, dates, cross-references — essentially everything except thumbnail versions of the images themselves. These are ready to add, but I must first secure permission to post them, and I have only just now initiated that process — so we’ll need to be patient! I hope this will be of use to the Tolkien research community. Please do let me know if anything seems awry! The ultimate goal of this index is to list all of the published artwork of J.R.R. Tolkien: drawings, paintings, maps, sketches, doodles — everything, in fact, that might be construed as art other than items consisting purely of Tengwar or Cirth writing. For these, see the excellent Mellonath Daeron Index of Tengwa Specimina (DTS) and Index of Certh Specimina (DCS), respectively. 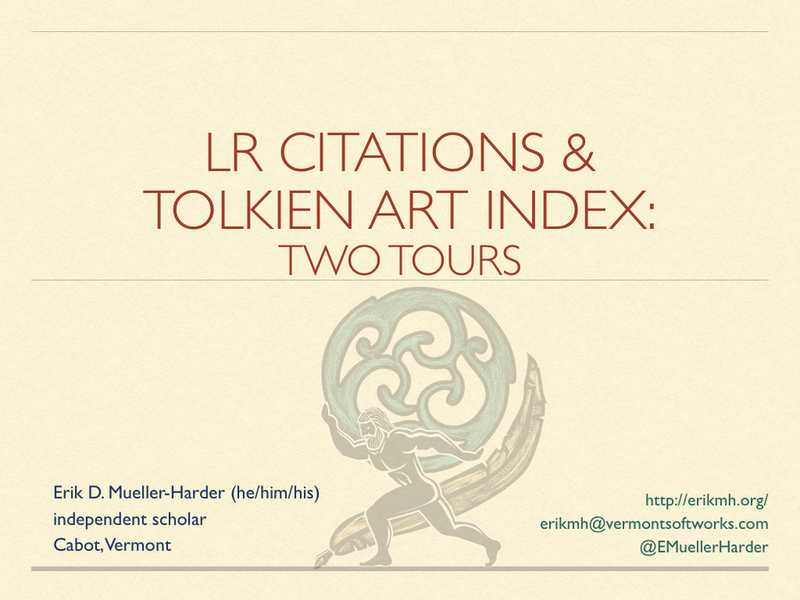 Such an index should ease scholarly discourse and provide an unambiguous shorthand for referring to Tolkien’s artwork. Currently, the index comprises only art related to Middle-earth in particular and Arda in general. Other Tolkienian art — whether fantastic or firmly grounded in the primary world — will ultimately be added; however, other projects are currently of higher priority. The index should be online and available at http://tai.vermontsoftworks.com/ sometime in July. There is no perfect order in which to list these works. Perhaps the most obvious possibility is date of composition; unfortunately, for most of Tolkien’s artwork we would be forced into educated speculation as to the exact date — and often (especially in the case of maps), composition of one work continued for months or years. Categorizing works (as “maps,” “sketches,” “elevations,” and so forth) is also a mechanism fraught with gray areas of forced interpretation and decision-making: is a bird’s-eye view of the Falls of Rauros a map? A sketch? And what of the drawings of Farmer Cotton’s house? And when the index is expanded to include all of Tolkien’s art, would it really make sense to include his sketches of real-world houses in the same categories? Another possibility would be to organize items by their geographic location, but then the question of scale becomes problematic: if we create a classification for “Mordor” and place sketches of Mt. Doom and Barad-dûr and Shelob’s lair in it, then where should we place a map that includes Mordor, Rohan, and Gondor? At the end, it seemed best to follow the time-honored practice of organization by accession number; that is, more or less, assigning each item a unique number as we first come to it. Improving a bit on such a “system,” we can imagine a world in which the TAI was created in the early twentieth century, with new artwork added to it as it was published. And this, indeed, is what we’ve tried to recreate, with the first items listed in the index detailing the artwork published in the first edition of The Hobbit from 1937, and the last items cataloguing material published for the first time in The Art of The Lord of the Rings in 2015. The cardinal rule of such a system is that the numbering will never change, so as new items are added to the index — whether because they are published for the first time or because they were not originally within the scope of the index — they will simply be added to the end. As with so much else, this too is a compromise; however, it does mean that everyone may simply and safely refer to (for example) TAI #67 and it will in perpetuity unambiguously refer to the watercolor “Nargothrond” that appeared as figure #33 in Pictures of J.R.R. Tolkien, as figure #54 in The Art of The Hobbit, and as the April feature in the 1979 Silmarillion Desk Calendar — and which was first published as the May feature in the Allen & Unwin 1978 Silmarillion Calendar. For listing the details of publication, most information came from the published items themselves, in our library at Vermont Softworks, (sc., my bookshelf). For those items which we do not own, however, invaluable help came from Wayne G. Hammond and Douglas A. Anderson’s 1995 J.R.R. Tolkien: A Descriptive Bibliography and from The Compleat Gyde to Tolkien Calendars. Obviously, this listing will be far more useful if it includes images of the works in question. Users will be able to tell at a glance which draft of Thror’s map or which of the various Nargothrond illustrations is being referred to. I am applying to the Tolkien Estate for permission to include small thumbnails with each entry, such as those shown in the sample image here. These thumbnail images are ready to be uploaded to the server once we have received the Estate’s approval; until then, no images will be shown. Under no circumstances will full-sized images be available.